Within a photographic print attributed by William A. Frassanito to Peter S. Weaver taken on November 19, 1863 from the 2nd floor window of the Evergreen Cemetery gatehouse are two men facing in a direction away from the camera and hauling what appears to be a long ladder probably for use as a photographic platform (see detail below from file 32845u.tif, courtesy of the Library of Congress). Might these be the late arriving Tyson Brothers on their way to a position for photograph taking on or very near the border between the grounds of the Gettysburg Soldiers’ National Cemetery and the private Evergreen Cemetery? These Tyson Brothers candidates are highlighted within a circle in the image above; a red arrow indicates the direction in which they appear to be proceeding. 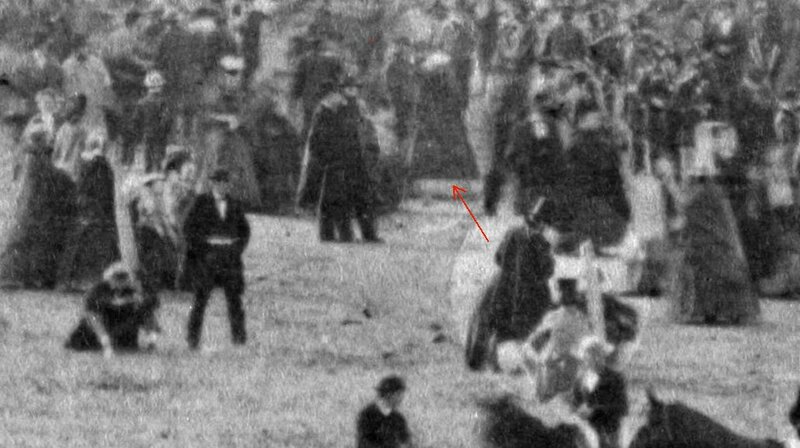 The lead figure (#1, above), wearing a dark coat and a tall stovepipe hat, appears to have crested over a small rise — mimicking a topographical feature existing today near the Evergreen Cemetery gatehouse — because the lower half of his horse is obscured. The trailing figure (#2, above) also wears a tall formal topper but is bedecked in a very light-colored coat. He appears to be managing a tall ladder over his right shoulder (perhaps he drew the shorter straw?). It isn’t clear if he is walking or also riding a horse. At some distance in front of him is the partially blocked image of a man or boy (#3) who appears to be considerably shorter than #1 either because he is on foot and/or not nearly as tall as #1. The male designated #3 is cradling a square or rectangular object in his right arm against his side. That object may be a case containing glass plate slides or photographic chemicals. The rider designated #1 appears to be turned in his saddle facing in the direction of and looking down towards #3. We get enough of a view of individual #1 to see that he has long dark hair tumbling out beneath the back of is hat and a dark sideburn running into a beard, features bearing a considerable resemblance to the same seen in a photograph of Charles J. Tyson at page 29 of William A. Frassanito’s seminal book, Early Photography in Gettysburg (1995). Mr. Frassanito dates that photograph to 1860. Isaac G. Tyson, who looked much like his brother, is pictured sporting a goatee in a c. 1863 photo both at page 29 of Mr. Frassanito’s aforementioned book as well as at: http://pacivilwar150.com/ThroughPeople/Civilians/GettysburgPhotographers/PhotoGallery. The more diminutive fellow, #3, may well be the Tyson Brothers’ assistant, William H. Tipton, who was then just 13 years-old and in later years took over the Tysons’ photography business in Gettysburg. If these are the Tyson Brothers, it appears that they are on their way to a spot where a ladder already has been deployed (boxed in yellow, below). Perhaps their objective was to set up two ladders side-by-side to create a photographic platform. It is not clear why the backside of the deployed ladder appears to be backed by a dark triangular-shaped piece of cloth with a straight-lined bottom horizontal to or laying on the ground. Although the purpose of this feature is not fully understood — perhaps it had to do with a portable darkroom setup — it does support the conclusion that what we see are not stacked arms, but, rather, a tall folding step ladder observed from a side angle. On the apparent ladder already in place, boxed in yellow, stands a man (marked #4) a rung or two off the ground. He is facing in a direction more-or-less opposite to the speakers’ platform with his right arm extended gripping the leg of the ladder or something reflective on the ladder. He might be assisted by a man marked as #5 facing the camera and another possibly standing on the opposite side on an even higher rung facing roughly towards the speakers’ platform, marked #6. However, it is just as likely that #6 is a man standing in the background, in which case only one or possibly two men had gone out in advance of the Tyson Brothers candidates to begin the process of erecting their photographic platform outside of the crowd gathered on the dedication grounds. If so, we can deduce that the photo taken possibly by Peter S. Weaver and his father from the 2nd floor window of the Evergreen Cemetery gatehouse was created well before the third and final Alexander Gardner stereo view was exposed. The location of those two men in Gardner’s third view comports with the positioning of the already deployed ladder boxed in yellow, above, giving further weight to the conclusion that they are the same men seen in the photo attributed by Bill Frassanito to Peter S. Weaver. Neither of those men are visible in that location in Gardner’s first two stereo views, illustrating the considerable time gap between Gardner’s second and third views. 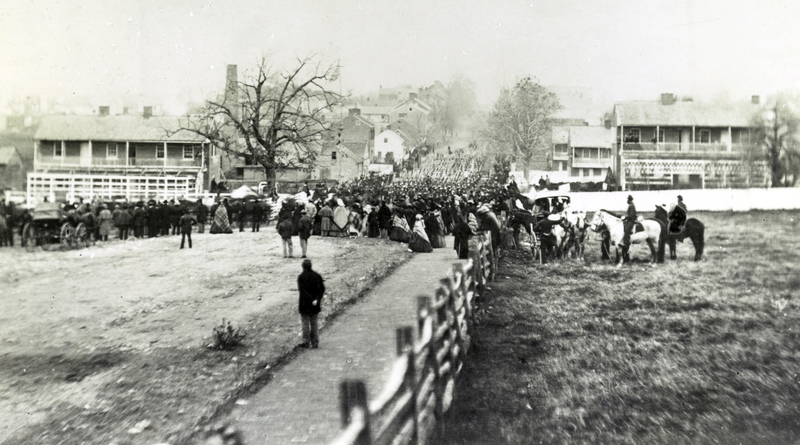 I tip my hat to Charles J. and Isaac G. Tyson for the three surviving procession photos they took in Gettysburg on November 19 (see detail from one of them, below, courtesy of the Library of Congress). But I must remove my hat to scratch my head in puzzlement over what happened to any photographic exposures they made from their elevated platform at the cemetery — were any of them ever printed? Hopefully what became of those cemetery views will be “uncovered” some day soon. Should they be discovered, those images could represent the Tyson Brothers “crowning” photographic achievement. All of the text and marked images contained in this blog are copyrighted; all images are derived from the photographic collection of the Library of Congress, Prints and Photographs Division Washington, D.C. I actually own a painting by Anton Berger and I’m thrilled to know this about him. I purchased the painting at an antiques auction in NJ about 25 years ago. I’ve done research on Berger through the years and found very little on him. Up until now all I’ve known about him is that he was a German (genre) painter and lived in NYC.